From facilitating the collection of entries to helping you pick a winner, competition apps are standalone apps or plugins designed to make your competition look good and run smoothly. 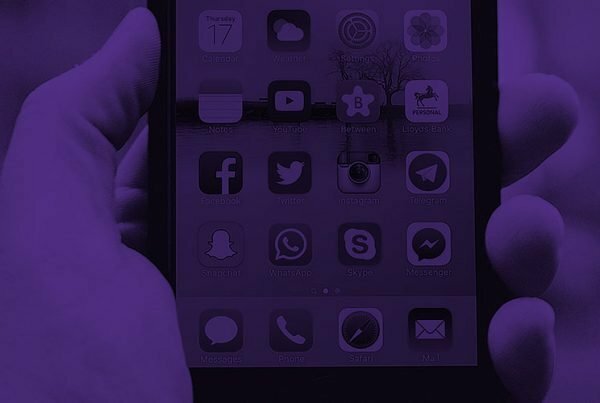 Unlike competitions run on your Facebook page timeline or Instagram profile, apps offer more exciting and complicated entry methods and collate your entries for you instead of endless scrolling through posts counting up entries… the problem is, there are SO many apps out there, it can be totally daunting choosing the right app for your competition. Enter OrigamiGlobe’s Chief Competition Nerd Suki, with another super helpful guide to help you on your way. Below you’ll find the most comprehensive guide to competition apps and plugins anywhere on the internet, including the pros, cons, pricing, support and functionality of each. If we’ve missed an app or you have a question, let us know in the comments or email me! How do third party apps help? Is there any point in using one? Before you choose an app, you should probably work out if you actually need one in the first place. I love a good pros and cons list, so let’s take a look at the advantages and disadvantages of using a competition app. Some ‘free’ trials aren’t actually free so watch out for those! So should I use one then? If so, which one? It really is a case of looking at your budget and your competition goal. If the aim of your competition requires email collection, you’re almost certainly going to need a third party app or a dedicated landing page on your website. Test your tactics during the course of your competition, so you have some idea of what to implement in your next competition – for example, wording of your posts, imagery used in your posts, number of posts, prizes offered, day of the week and time of day you post and whether paying to promote or sponsor has an impact on engagement. Work out your ROI – how much did you spend, how much did you make (not always in dollars, but could be measured in increase in subscribes, page visits, e-course signups etc) basically, did running the competition add value to your business and get you leads or direct income? If you decide that running another competition is a smart marketing move for your business, you can then consider using a third party app to make the process a little smoother and to save money now you know what messaging, imagery, prizes and budget work best for your business. I just want to clarify that OrigamiGlobe does not own and is not associated with any third party apps. Every single link below is a link to the homepage of the app, which is why I’ve written the link in full instead of hyperlinking and each link is NOT an affiliate link (i.e. it’s completely impartial, I’m not being paid/bribed/tortured by any of the companies to promote them and do not benefit from any of the apps if you sign up/don’t sign up). Yes, I could potentially earn a couple of bucks if I include affiliate links, but I don’t see the point in writing a biased and self-serving guide, so read on safe in the knowledge that I’m genuinely providing an objective opinion. Summary: They have a free timeline contest manager. Free. The rest of their tools cover everything from CRM style tools to social media monitoring. Description: In my travels around the contest app corner of the internet, this one kept popping up. The platform is more than just competition (or contest as they call it) management, it’s also like a social media management dashboard (think Buffer and Hootsuite). You can access their free sweepstake, quizzes and photo competition tools via the ‘free tools’ link in their website menu or footer. Pros: Their tools are free for a start and they offer three different types of competition tool. I like that they also have an option to only include one entry per person, if you’ve stipulated multiple entry not permitted in your T&Cs. Cons: Remember it can only pick a winner from a single post, so keep your entries on one post only. I also had real difficulty getting it to connect to my FB page and I couldn’t log out to try and connect again so had to cobble together my review from an old review I’d done and a very handy page Google kindly translated from Spanish for me… #truestory. Price: Free! They do have paid options but there are no extra competition tools included. Support: Given that it’s a free tool, I didn’t expect much from support, but a little live chat box does pop up and clicking the question mark in the menu bar opens up an email to them. Not bad for a free tool! Straight out of the box: I tried the free version which looks pretty simple to use. It logs straight into your Facebook from the browser, you pick your page and your single competition post (so remember to write the post in advance! ), choose sweepstake (i.e. like to win or comment to win), quiz or photo contest, choose to pick a winner by like or comment (or both) and how many entries they’re allowed, then hit pick a winner. It’s a super quick process. Functionality: It’s pretty basic, but what do you expect for a free tool? Timeline competitions are always going to be fairly simple as you’ve only really got likes and comments as your entry method. Agora Pulse’s handy little tool definitely takes the pain out of picking a winner from likes or comments on a post though. Compatibility: Only does Facebook competitions and only picks a winner from likes and/or comments on a single post only. Summary: This little app has come a really long way since I reviewed it back in 2015 when I originally wrote The last guide to competitions. It’s definitely hands down the easiest tool to set up (I set up a test competition within 10 seconds) and it just may have inched into my top spot for a competition app recommendation. Description: This app looks like it’s very much integrated into and part of Facebook and features on apps.facebook.com. 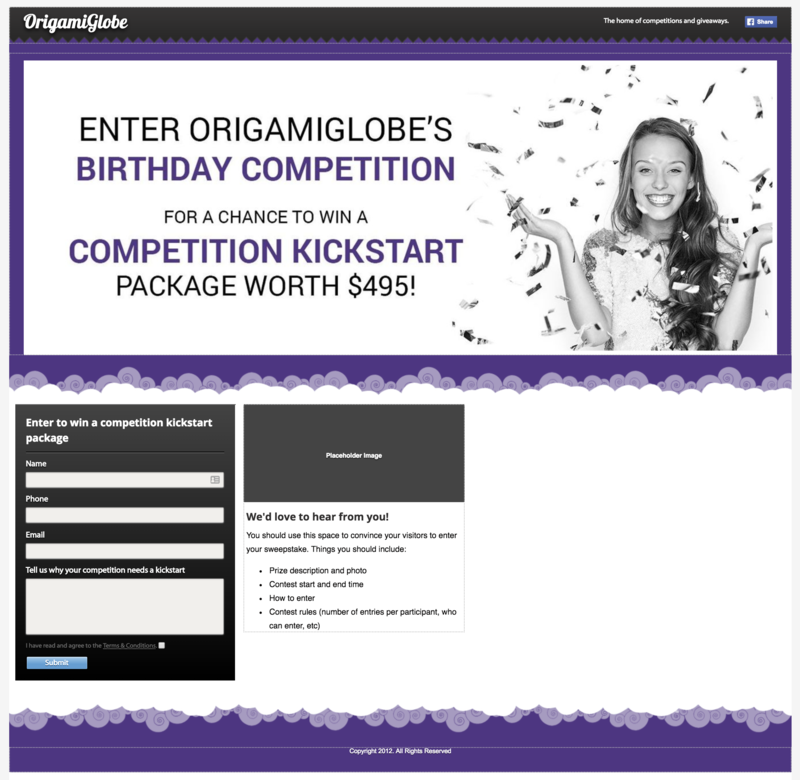 Clicking on ‘New contest’ gives you the option of a timeline competition or a form embedded on your Facebook page which lets you collect emails. Pros: Very much part of Facebook and crazy easy to setup, even your nan could do it. The live notifications when people enter are pretty cool and you can add custom questions to the form contests and entrants can fill in the form using their Facebook details which makes it super quick to enter. I love the feature on the timeline contest where you can filter by correct answer only simply by typing the answer into box. Very cool indeed. Cons: The free version is limited, only allowing 40 entries before the paywall locks the rest of the entries, plus a small ad appears at the bottom of your form and you can’t integrate it as a post on your page. Other than that, their tutorial video uses ‘win an iPad’ as their example. You know how I feel about giving away damned iPads so don’t follow their lead! Based in: Canada. Lot of competition apps based out of Canada. Price: There are three price tiers: Premium Plus at $8USD per month, locked in for one year which still only gets you 1000 entries per contest, a Premium Pro version at $18USD per month for one year for 10,000 entrants (unclear whether this is per competition or over the year?) and Premium Enterprise at $28USD per month for one year which gives you unlimited entries, 10 admin users, ability to integrate into your website and a custom URL so you look legit. Though all plans are locked in for a year, they do have the option to buy a one-off contest for $49USD or $99USD – which gets a ‘like’ from me. Support: The ‘Contact us’ link reminds you to check the pretty comprehensive FAQ before contacting them, but if you still have a question you can submit a form. Straight out of the box: I set a test competition up in about 10 seconds… I’m not exaggerating. Functionality: Whilst the free version is limited in the number of entries, for a free app it’s pretty customisable and you get previews before it all goes live. Just be aware there are restrictions on the free version. The premium version is actually really good value for money. Initially, back in 2015 I marked it down as expensive for what it was, but they’ve really upped their game and worked hard on the app that it’s a top contender now. It’s definitely the easiest to use. Summary: Expensive for an ongoing subscription. I recommend running a free test campaign, then seeing if it’s worth the price tag for your business. Description: We’re off to a great start, the first promo is free and then you can pay either per promo or as a subscription. Starting the process is super simple, though once you get through to the editor there are a lot of options and tabs. Anything advanced (colours, additional fields, email automation) is classed as an ‘extension’ and charged at a premium. There’s also an ad at the bottom of your entry form. Pros: The first promo is free and they now have 21 different options for competitions. Sharing is also really easy and the whole app has a nice, clean design. You can also pay per promotion which is a welcome feature. Cons: The cheapest package is really limited and it’s really not the most attractive entry form. For ‘sweepstakes’ (enter your information to go in the draw to win) the form looks pretty bland and uninviting with no real explanation or hype around the prize, but if it was embedded in an overall landing page I suppose that would do the job. Based in: Spain, though the website and apps are in English, among other languages. Price: Pay per promo or for an ongoing subscription. The super basic promo you see above is $19USD one off and offers limited design changes and up to 1,000 entries. The premium package at a $100USD per promo (that’s a hefty price jump!) gives you a lot more customisation, 10,000 entries and a bigger range of competition types to pick from. The white label (which really isn’t applicable to small businesses) is $250USD, for a one off competition. The pay monthly packages start from $29USD per month for the most basic of features on Facebook and Twitter plus photo and writing competitions. If you want full access to all of their apps you need to get the premium version at $159USD per month but it will still have the Easypromos branding across the bottom which I think is a little cheeky. I do however like that they have no lock-in contracts, you can subscribe month to month for the duration of your competition. Support: There is an online help desk and a knowledge centre as well as a contact form and email address. Straight out of the box: Easy to get started but becomes a little trickier when you get to the dashboard as you get overwhelmed with options and tabs (took me a while to find my promo again once I’d created it). Functionality: To make the most of Easypromos’ functionality, you really have to pay top dollar. You’d probably have to run a test campaign through them first and see if you like it and if it gives you a good return on investment before you go shelling out for a subscription. Compatibility: Heaps. Some of them are a little more polished than others, for example the ‘pick your favourite’ option is just a hot mess in terms of layout and ease of use, but the sweepstakes app (pictured above) as well as their tools to help you pick a winner are by far the most useful. Summary: Limited to 4 different types of game as the entry method, but if games are right for your business, I’d bet these guys would get you the results you need. Description: This one’s a little bit unique in that it only offers 4 types of ‘competition’: a puzzle, a memory game, a photo competition and a quiz, so not for you sweepstake fans. To be honest, the stock apps would have limited use, I think the real value here would be in getting them to develop a custom app if you’re looking for something a little more special and less gimmicky or out of the box as some of the other apps listed here. I do like that they pointed out that the page-time engagement is higher with games (vs form fills) and evidently have the research to back the claim up. When you consider that the page started off with 4,587 fans, I’m pretty damned impressed! Cons: Only 4 app options available plus a custom build and the contest duration is fixed at 8 weeks. Other than that, it’s pretty hard to fault them, they have their niche and it looks like they’re doing pretty well for themselves! Good on them! Based in: Croatia, though there is a form and an email to contact them on. Price: Their cheapest apps are the quiz and photo contest at $340 (USD presumably?) each as a one-off fee. The memory game is $698 and the puzzle is $878 both USD – I guess. Custom app requests must go via the contact form. Support: No support centre, only the contact form but support is listed as included with every app as the first inclusion in the pricing table. Straight out of the box: Unable to tell as there was no free version to play with. Functionality: Though they are limited to 4 apps (plus the custom option) it looks like they really nail these 4 apps very well, they’ve got a great client base with an impressive track record. If I needed a game app I get the impression I could trust these guys to do a great job. Compatibility: Facebook only, possibly web-based too? Summary: An Aussie developed app that’s next to foolproof to use and really promotes sharing. Description: Gleam must spend a ton on advertising, because they’re always at the top of my Google searches with their paid ads, so I wasn’t sure if I’m just fond of them because of the sheer exposure I’ve had to them, or because I dig their product. Since working with their app on some client projects, I’ve realised it’s because they’re actually really easy to use and are great at what they do. Pros: Free plan (woo hoo! ), heaps of platforms to run your competition on – I really like that they include YouTube and Snapchat as a competition option, no one else has really cottoned on to this yet and I believe video will be a huge part of our competition futures. Very easy to use and set up, the focus on sharing is great for businesses just starting out. Ridiculous amount of entry methods offered so you’re bound to find the perfect entry method for your business. Cons: The free plan is pretty limited (as can be expected) – you’re only allowed the name and email field, any additional fields will cost you and you won’t be allowed to download the CSV file of entrants so you really do need to pay to get the full value from the platform. Similarly, additional ways to enter (such as Snapchat) are saved for those with a more generous budget. Annoyingly (but understandably) you can’t add an image of your prize in the free version either. The look and feel of the app is pretty heavily Gleam branded unless you pay for a business plan which allows full customisability so not wonderful for brand recognition. Price: There is a free plan (though it comes with limitations), otherwise prices start from an extremely reasonable $10 per month, which I’m assuming is AUD and is only available if you commit to a yearly plan. From there you can choose the Pro Plan which is $49 per month ($39 per month billed yearly) and offers more inclusions than the Hobby package; the Business Plan which gives even more features including a lot more customisability and removal of Gleam branding at $149 per month (or $119 per month, yearly) and finally Premium Plan at $399 per month ($299 monthly when billed yearly), which gives you the whole enchilada including something called ‘Leaderboard Embed’ which sounds very intriguing indeed to a competition nerd like me. Support: Support options have changed a number of times over the years but currently seem to be a contact form on the contact page, or once you’re logged in, you have a support link which directs you to a documentation area, a support chat room, or submit an enquiry via a form. On the pricing and features page, there are inclusions listed for email support, chat support, slack group and priority support, so the more you pay for your subscription, the better support offering you get. Straight out of the box: Once I got in it was pretty quick to create the competition, though I wish I could have seen a preview of my competition before installing it using the code generated. Functionality: The free version is pretty damned good even if most of the best features are saved for the paid accounts (obviously). It’s still a great little tool, especially for first-time competition creators to work out what works and what doesn’t, but where this app truly shines is in its sharing functionality which awards extra entries for every share. This could be really insightful to see what your audience is happy/willing to do in return for an entry – for example, your Facebook audience might love to hop over and follow you on Instagram or retweet your competition on Twitter. It’s basically some great free market research on your audience whilst building your community and rewarding them with extra chances to win. Compatibility: Gleam sits on a tab on your Facebook page, on a page hosted by Gleam or on your website, but it offers entry via all the main channels you expect to see: Facebook, Instagram, Pinterest, Twitter, Google+, LinkedIn and YouTube plus Snapchat, SoundCloud, Steam, Tumblr, Twitch, Vimeo, Eventbrite, blogs, app downloads, website visits and custom entry. By far the most comprehensive app out there! Summary: Simple enough for beginners, customisable enough for advanced users, though it really is just forms and landing pages. Description: The first thing I noticed (and liked) about Heyo was that it includes a countdown timer adding to the need for your audience to act now (nothing like a deadline to encourage entries!). The process to get started is incredibly easy and consists of only a few steps and you’re ready to publish. The dashboard is super easy to navigate and insightful – listing your likes, impressions and emails collected loud and proud at the top of the screen so you always have your eyes on the prize – so to speak. Pros: Their drag and drop editor is out of this world awesome, you can even have ‘hotspots’ on your images that click through to a URL, think linking to each of the products you include in your giveaway package. Everything (and I mean everything) is customisable. They also have templates you can use which are clearly going to be optimised for the goal you’re trying to achieve plus there’s no code to integrate your competition to your social media site – result! Cons: The free trial is a 7 day trial, so you’d only be able to run a flash competition to try it out. I can see the drag and drop editor being a little overwhelming for people who want an out of the box solution, so you need to remember to click the template tab if this sounds like you. Price: Their pricing plan has been updated moving to a more tiered structure like other apps and their plans now start at $45USD a month ($25 per month on an annual subscription) for a one-off campaign or 3 campaigns total on the yearly plan. Entries are limited to 5,000 a month. The next tier is $99USD per month ($84 per month, billed yearly) and includes between 10 and 15 campaigns depending on monthly/yearly billing and gives more generous limits on entries, Facebook page likes and campaigns. The third tier is $249 per month ($199 per month, annually) with higher allowances again. The agency white label/one off campaign tier is also still available, price on request. A couple of features worth pointing out are that it appears the drag and drop editor and email integration are only listed as included on the $99 per month tier and above which is a bit cheeky in my opinion. When I first reviewed Heyo, I commented that “it’s my favourite pricing so far – simple, to the point and not over the top expensive” but their pricing remodel has definitely changed my mind. I’ve noticed now that it does state they are a Votigo (another app, listed below) company so perhaps that has something to do with their fee restructure? Support: The support link in the footer just opens up your email provider on your computer to send an email (I hate that, don’t you?) though there is a phone number for sales listed in the menu bar. Straight out of the box: Ridiculously simple to set up and customisable too, though I wonder how customisable the templates are now they’ve taken the drag and drop editor out of the basic plan. The templates are going to save you a lot of time and are obviously optimised for maximum entries so it’s still a win for me. Functionality: I rated Heyo really highly when I first reviewed it, but since the pricing has changed, it’s definitely lost some functionality on the basic plan which knocks it down in my estimation. The templates are still fantastic though and the fact that you click a few buttons and have a functioning campaign ready to go really works in its favour. I love that you can build and see your campaign before you commit any money. Compatibility: Facebook and website integration only, with an option for hashtag competitions which is really just an explainer image showing the steps and hashtag to use. Summary: Iconosquare, whilst primary an analytics and scheduler tool for Instagram, did offer a ‘contest app’ and separate offering to run and monitor competitions. They have made quite a lot of changes and improvements to their main service over the past couple of years, especially with the changes Instagram brought in with regards to third party apps. It could be that this offering will come back remodelled and better than before, or it could be that they have removed it to focus on what they do best. For the time being they don’t offer competitions. Summary: Interactwive used to offer a Twitter-only contest management tool that helped you generate a series of tweets promoting your competition and links back to your account; then collated entries for you and helped you pick a winner. It had confusing pricing and basic functionality but was pretty good if Twitter’s your bag. It seems as though their social accounts have been abandoned, so don’t count on this one being resurrected any time soon. Not only does the finished competition look great and easy to enter, they also give you a tonne of integration options such as sharing to Facebook, sending to someone in Messenger, Tweeting your competition, sending out an email, embedding on your website and copying the link to the standalone giveaway page hosted by KingSumo. 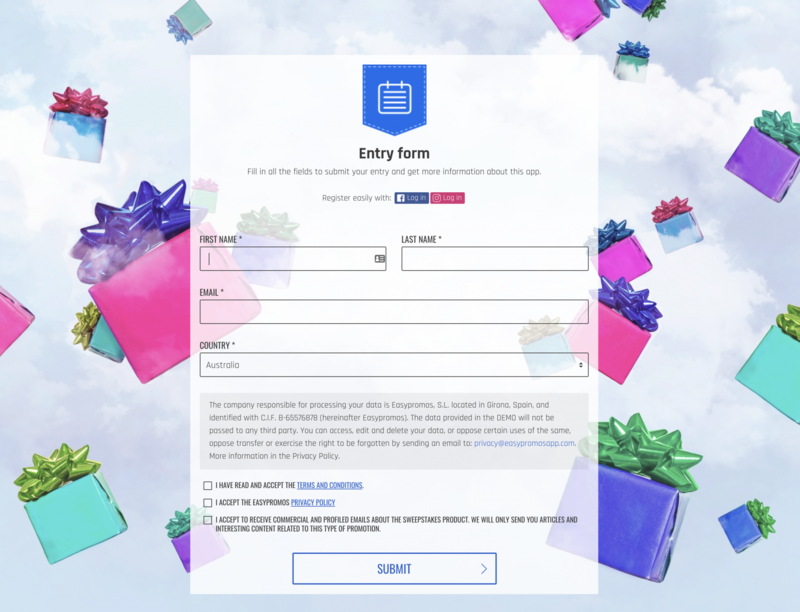 Pros: Ridiculous amounts of easy to set up – there’s a form you fill in with the competition name, description, prize amount etc and it generates the competition you see above from your info. Super simple, super basic. It appears I can send that out into the world right now, for free. I love that they give you a bunch of ways to promote your competition straight away too. Everyone knows promotion is the key to a successful competition. Cons: I worked out what made me so suspicious; I think KingSumo’s free giveaway creator might just be the biggest contestception going… they use the free contest app to grow their own mailing list by using your competition (and prize) to do it. Let me explain. In the FAQ section of the KingSumo giveaway app, hidden right at the bottom, there’s an FAQ that asks ‘I ran a giveaway, and my entrants got an email after the giveaway ended. Why is this?’ and goes on to explain that all your entrants are added to the KingSumo database to which they promote the KingSumo contest app, thereby generating more contests and more emails and so on and so forth. Taking off my sceptic’s hat, other limitations you might actually be more concerned about are: you can’t upload your own T&Cs (yet) which is not cool at all as we all know how important those T&Cs are, plus you can only upload one prize (for the time being). There’s also the fact their logo is sprawled across the bottom unless you pay to remove it, not a deal breaker, but worth noting. Price: There’s the free version, but also a paid version at $19 per month, locked in for a year, which allows you to upload your own logo instead of their branding, integrate your Facebook pixel (for those of you that run ads and remarketing) and also stops that pesky email promoting KingSumo going out to your audience, though I’m pretty sure they’d still keep a copy of all of your entrants’ details. Support: There isn’t a contact page, but there is a support link in the footer which opens up a contact form. Straight out of the box: Could not be simpler. 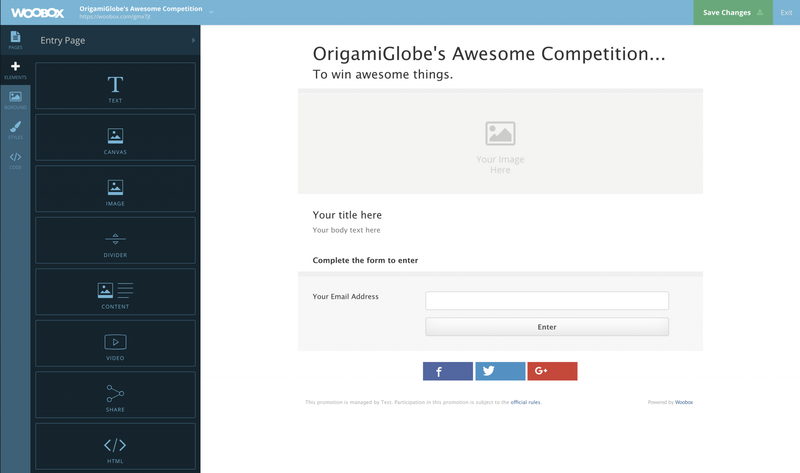 Fill out the form fields and click save and your competition will be automagically generated. 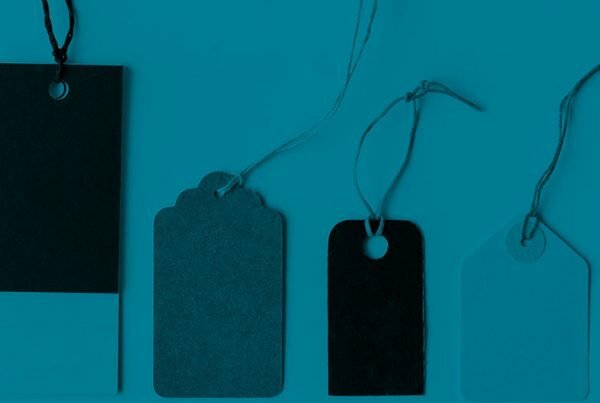 Functionality: It’s a pretty good offering for a free app, includes all of the info I loved about the WordPress version (countdown to close, prize value, number of winners etc) wrapped up in an easy to enter package which is guaranteed to have a high conversion rate from visitor to entrant. I didn’t run a real competition so haven’t seen the winner picking tool or winner announcement but I’d imagine it would be as user-friendly and simple to use as the app itself. Compatibility: They still offer the WordPress plugin as well as the online competition app. The app can be embedded on your site, given to people as a link or shared on socials. Summary: Mostly focussed on Facebook and social media design, management and scheduling, contests are more of a bonus tool. 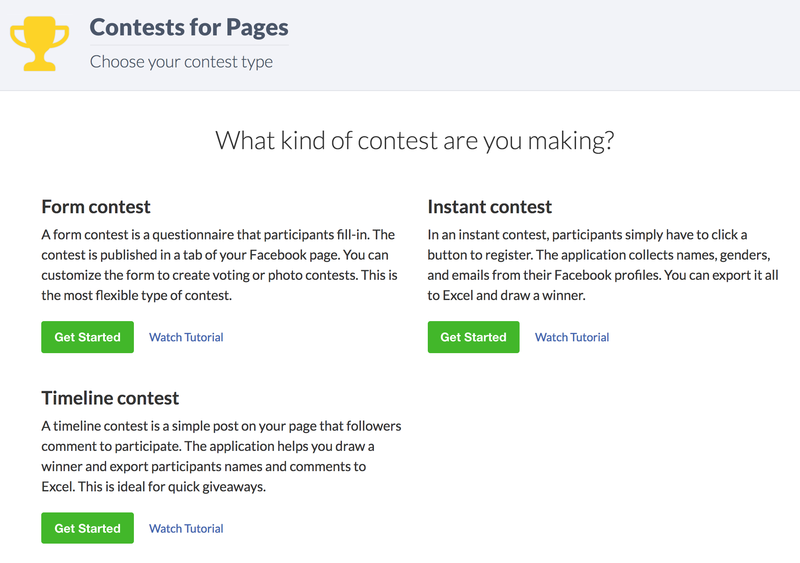 Description: Pagemodo has a whole bunch of tools and features to make your marketing life easier, one of which is the Facebook contests and sweepstakes tool. It lists 4 quick start steps to getting your competition up and running: 1) create account 2) select template 3) customise and 4) publish. Sounds pretty simple! Pros: The editor is really simple to use and whilst there’s no design customisation, you do have full control over the entry fields and text copy. You can publish straight to your Facebook page with no code which is awesome and there is a host of other page/post management features included too. I love that in the editor they prompt you to include some blurb about your competition such as your prize description and photo, competition start date and end date, how to enter and your rules. Cons: My biggest beef with Pagemodo, is that to try the platform for free, you must hand over access to your Facebook page, access to your ad analytics, give permission to run ads on your behalf and permission to post on your behalf as well as manage your page. Just to see the platform in action. Other than that, whilst the editor is pretty simple to use (albeit clunky) it’s not hugely customisable at all. The design and fonts are all fixed which gives you limited opportunity to create brand awareness for your own company, just check out that font OrigamiGlobe is written in. The main section is an image I created myself in Photoshop for a past competition. Price: You need to get the Pro version to include contests and sweepstakes which starts at $10.95 (USD I guess) per month or you can opt for the Agency plan which allows unlimited pages, more team members and a white label option for $23.95 per month (also USD?). Support: The support on this one is actually pretty comprehensive, when you’re logged in and click the ‘support’ button you get the option to check out articles, email them or talk on the phone with an agent. Great support options, well done Pagemodo. Straight out of the box: Very easy to get started (once I’d given access to everything…). 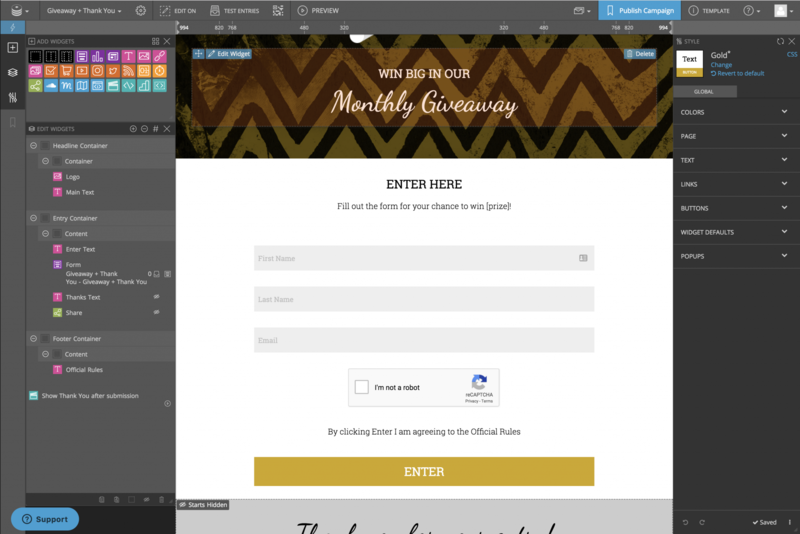 After heading to the dashboard and selecting ‘contests’ I was asked to pick a template and then was able to modify very limited features in terms of design and layout, but was given full control over the text edits, entry fields and was allowed to upload a banner image instead of just text. Once I was finished editing, I was given pricing options before I could continue further. Functionality: Great potential, but limited without paying money. Once you pay the monthly fee, you do get the pro templates included, but there are only a handful of preset templates so it’s still not truly customisable. One important thing to note: it would appear that Pagemodo create a new tab on your Facebook page to run competitions, a function which is only unlocked and available to use if you have 2,000 page likes or more, rendering Pagemodo useless if your page has fewer likes than this. Summary: Great potential and easy to use but very average offering compared to competitors. Description: Promising at first glance, they have a free signup (woo!) and estimate a 5 minute set up time. Result. Logging in takes you to a dashboard that looks very simple to understand and aimed at giving you a high-level overview of all your campaigns. In reality, it’s very limited without paying for anything any more advanced, but there’s also no way to see what the competition would look like as the form never actually loaded for me. Pros: It’s pretty simple to set something up very quickly and if you’re looking to get your competition out to a wider audience, you have the option to list your competition in their directory. I like the easy to use dashboard that gives you a very high-level view of all of your campaigns. The data also looks like a very useful tool for analysis and allows you to export to CSV. It also syncs with a couple of well-known email providers. I like the feature that automatically generates rules for the competition if you’re on a paid plan, however, they are for US-oriented rules which are different, so beware! Cons: You have to fiddle about putting the embed code on your website despite their claim that no coding is required (big thumbs down on this aspect) or post to your Facebook page without code. It’s pretty limited in terms of customisation unless you pay up and whilst they do state that their competitions also integrate with Twitter, Pinterest and Instagram, this doesn’t appear to be a super simple integration option at the time of publishing, so I wasn’t able to see how to integrate on those platforms. The giveaway directory (list) and giveaway network (promotion via their newsletter, social media and website ads network) have huge potential to get your competition in front of your audience – if they’re targeted. If they’re not targeted, you’ll be wasting your competition just to get high entry numbers. Based in: USA (judging by the comment on the automatically generated rules). Price: Starting at $14USD(?) per month (or $171 for the year) for Basic access which does say it includes different designs and rule generation; $29 (USD I assume) per month, or $351 annually, for the Businesses plan which includes email integration, refer-a-friend and customisations or $52 per month ($711 for the year) for the whole hog, including a page designer, removing their branding and Google analytics integration. Support: A link in the footer to a page of FAQs/help docs and a link to ‘submit a request’ via a form. Straight out of the box: Very quick to get started, but very limited right out of the box. The preview also took an abnormally long time to load so I actually never saw my campaign before I hit publish. Functionality: Starting a new campaign lets you set up the text, start/finish date and number of winners, then it’s on to the entry form where you can also add some bonus ways for them to gain entries such as by tweeting or pinning. You can then add your rules, sizing and thank you message. 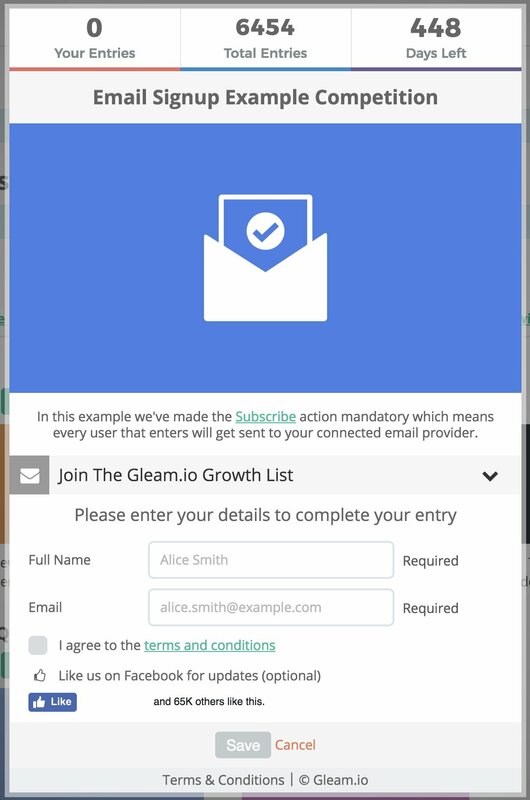 The next screen has customisation options only available to paid customers and allows you to change the colours and customise the entry form otherwise you’ve only got 2 generic templates to choose from. It’s a very straightforward process with the steps laid out at the top of the page, just make sure you have time and patience to allow it to load. Compatibility: Facebook and website, apparently Twitter, Pinterest and Instagram too though I couldn’t see these options, perhaps they’re on the paid plan? Summary: Free option with unlimited entries… but it is very basic in terms of design and only allows visiting a Facebook page as a method of entry, so you really need to pay up. 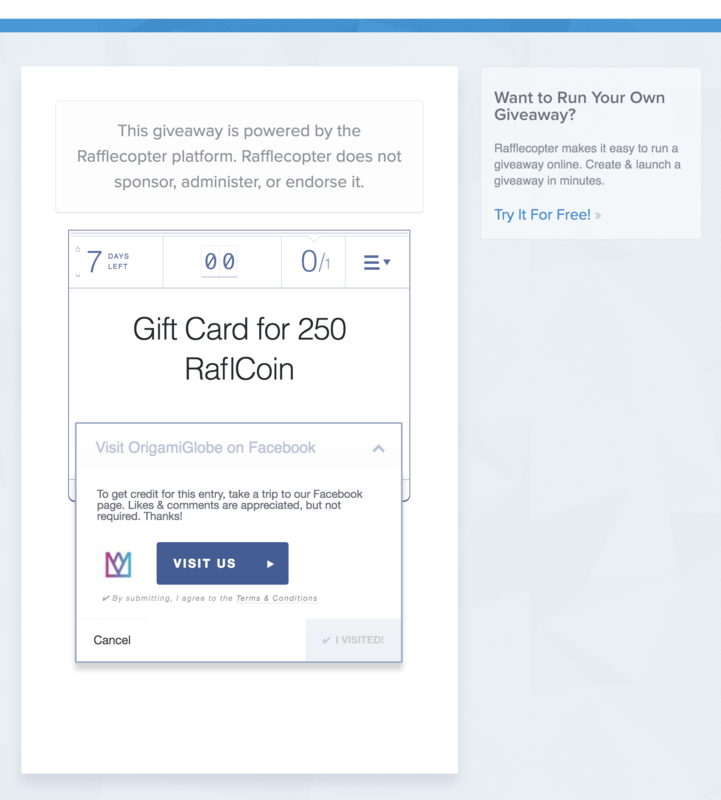 Description: I can’t decide if I like or dislike Rafflecopter’s site – their little smiley logo is pretty cute but the kids storybook illustrations mixed with their millennial ‘O hai!’s are just a bit odd. Personal preference I guess. The free version is pretty generous, offering unlimited competitions and entries but as expected, it’s pretty limited once you actually get to the customisation part and find out it’s visiting your Facebook page only, thanks to Facebook’s strict rules. It’s not a super ugly interface, but if you want pictures or email integration, like with others, it’s time to pay up. Pros: I really like that they make a point of stating that you can just go month to month if you want, so you don’t need to pay for a recurring subscription you won’t use. When you log into your dashboard, there’s a demo competition for you to learn how to get to grips with their platform. Good move Rafflecopter. Perhaps my most loved and equally most loathed feature is that they only allow visiting a Facebook page as a method of entry, as you can see in the screenshot above. Whilst it means they’re playing by the rules and not encouraging sharing or tagging and fostering genuine engagement on your Facebook page (which can only be seen as a good thing) it also means your entrants only have to visit your page and leave to get an entry… which means you could end up giving a prize away in return for, well, nothing at all. Cons: Limited customisation (as can be expected) but even the analytics is locked behind a paywall which is a little annoying. It truly doesn’t look too impressive on the free version, but what do you expect, it’s free! Price: Starting at the free plan and moving up to a basic package at $13 per month (assuming again they’re all USD) which allows you to customise the form, add images, use polls and surveys and access priority support. It also adds Pinterest entries but realistically I can’t see how that would be beneficial or relevant… The newly added ‘grow’ plan is $43 per month and adds one-click email integration for a bunch of commonly used email providers. Realistically, you’re paying $30 extra dollars per month to avoid having to hit ‘export’ and ‘import’ on your mailing list so I don’t think it’s worth it at all. Premium will set you back $84 per month and gives you themes, viral entries (share with a friend), real time analytics and no Rafflecopter branding. If it was me I’d add one of those benefits, probably analytics to the ‘grow’ plan to make it worthwhile. Support: There’s a super comprehensive Resource Center [sic] with articles, ebooks, guides, videos and webinars. You can also contact support via email. Straight out of the box: Possibly the easiest of them all to set up (though arguably the most basic). Functionality: Very limited but it’s free so what were you hoping for? I didn’t test the paid versions but I’d imagine they’d also be pretty simple to set up, with the added bonus of customisation to suit your brand. Compatibility: Facebook, Twitter, Pinterest, subscribe to win. Summary: One of the most comprehensive apps with a great design editor though some might find the editor too complicated. Description: Once logged in, hitting ‘new campaign’ takes you to the design platform where you can select a template and get going. Once you’re in, there are pop-ups that take you through the design screen. Pros: Even the free version is so packed with features and functionality that you feel like you’re really getting a lot for your money with ShortStack. 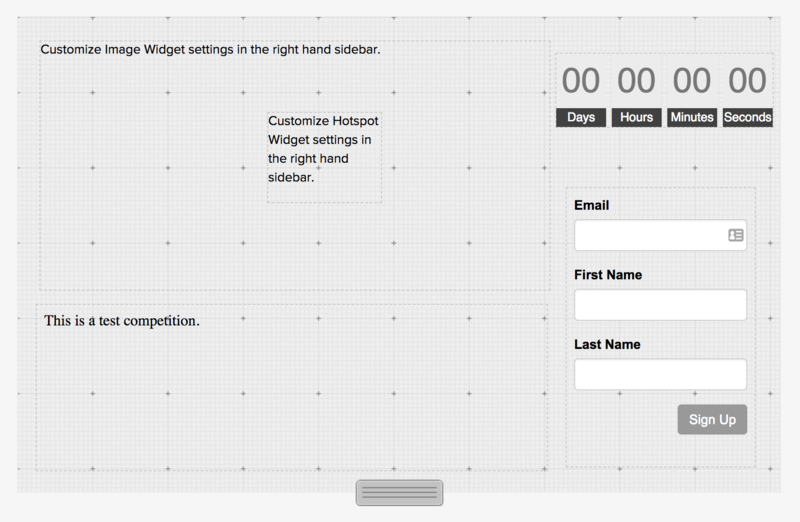 Pretty much everything is customisable and the drag and drop editor with heaps of widget options make designing your competition just the way you want it really really easy. One thing ShortStack does really well is help you along the way – with videos, help docs and getting started guides. Cons: The flip-side is the design screen is so packed with features it’s actually a little intimidating and the walkthrough that pops up gives you a little assistance, but not enough for it not to still be overwhelming. Sounds like a whinge, I really love that it’s packed with features (even the free version), but I just worry that some might find it a little too off-putting. The free trial only allows you to collect 100 entries and they describe their form builder as ‘intuitive’ which it really isn’t, sorry guys. Price: Their pricing page used to be incredibly confusing, so I’m really pleased to see they’ve simplified this page (though sadly they removed the cute package titles, named after varying portions of pancakes). The free package allows you 100 entries, after that you have to upgrade to the Starter at $29 a month to enjoy up to 2,000 entries and the ability to export your entries (which, let’s face it, is exactly why we’re collecting data in the first place – to be able to export it and use it). The next package is the Business package which ups the number of entries to 10,000 adds the ability to embed in your website, use as a pop up, integrate into Facebook and have a custom subdomain. The Agency package at $199 adds analytics and removes the Shortstack branding, upping your entries to 50,000 among other features and finally the Brand package at $499 per month gives you 500,000 entries and a dedicated account manager. Annual discounts are available. Support: From within the dashboard you can click on support and a window with suggested content pops up as well as the ability to chat. It looks like they’ve removed their email address which is a shame as I had to email them on behalf of a client after first reviewing them and their customer service was great. Straight out of the box: Super simple to get started, but the very detailed editor may take a little time to get used to. The ability to pick from templates definitely speeds up the process. Functionality: Definitely one of the most advanced apps out there and supports the big social media platforms, but some might find it intimidating at first glance. Bear in mind that the free trial gives you access to all of the paid features and widgets in the editor that wouldn’t be included if you stayed on as a free user after the trial was up so be careful. Compatibility: Facebook, Twitter, Instagram, Pinterest, Website and blogs. Summary: The app has potential, the price is just way too prohibitive, especially when there are so many alternatives available. Pros: The dashboard/wizard setup phase is pretty foolproof and for a first time competition creator and the new simplified pricing definitely works out cheaper than before even if it’s still crazily expensive. Website and iframe integration is a bonus. Cons: The last time I reviewed this app I had nothing but technical difficulties and it was the same story this time. Logging into my account gave me an endless loop of creating competitions without actually being able to create them which was incredibly frustrating. Doesn’t give me a huge amount of hope for their technical abilities I have to say. Price: Strutta have simplified their previously extortionately priced packages into one ‘do it yourself’ option and two ‘contact us for quotes’ packages. A one-off promotion with Strutta will set you back a whopping $250USD which is outrageous considering there are many free options out there or companies that charge only 10% of what they do for the same thing. The only way I can see this being cost effective is if you schedule a year’s worth of promos using their multiple promotion period feature, but even then you’re restricted to running the same competition multiple times. Support: They do have a support section with documents and questions as well as a ‘submit a request’ link. Straight out of the box: If we ignore the multitude of technical difficulties and assume I’m just unlucky with this competition programme, it’s pretty easy to jump on and get something set up. 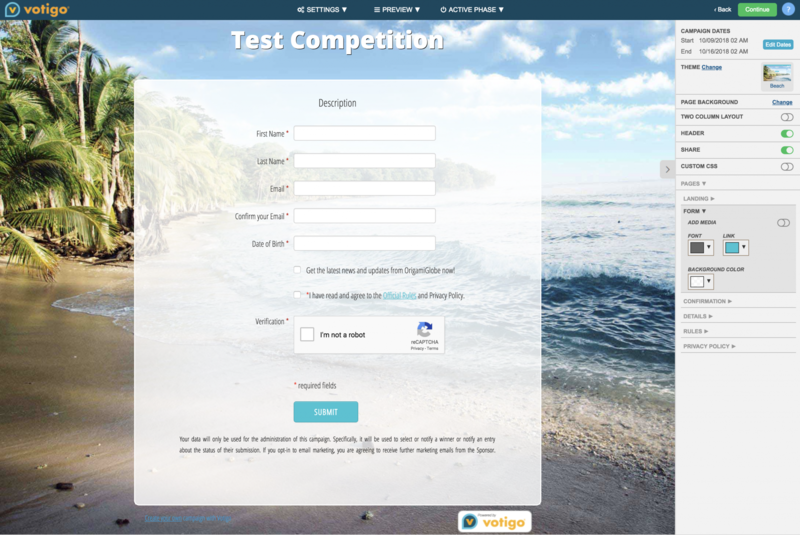 After selecting your entry method, you go through to the dashboard where you can create a new campaign which requires you to select competition type (Facebook, iframe or web), the dates and times your competition will be open (with an option for multiple competition periods), restrictions (age, location and number of entries), prize descriptions and design options before entering in your T&Cs. You can follow the whole process through right to the point where you hit ‘launch’… and a pop up box appears asking for credit card details to pay the whopping $250 fee. Ouch. Functionality: I’m going to be brutally honest. I thought the builder was better before, with a proper preview of what your $250 gets you. The new pricing structure is better and the site has had a refresh which is great… but the functionality just isn’t there to justify the price tag. Compatibility: Facebook, website and iframe. Summary: Huge range of apps, if you can find a few you need for your business it’s worth it, if you just want one, not really worth it. Description: Tabsite’s busy website offers a huge range of apps for every keen competition creator. From competitions to group deals, promotions and discounts to forms and surveys, they cover pretty much everything. Once I signed up for a free account, I was taken to my dashboard and asked to add apps. Clicking on ‘app types’ reveals the free apps I’m allowed to use, so I took a look at a timeline contest (one of three free options included). This picks a winner based on likes, comments or both on a single post in 3 steps: 1) select an existing post 2) select a winner by likes and/or comments and 3) ‘download’ entrants. The free version is very similar to other apps that just access a post and help you pick a winner. Pros: It looks like analytics are included with the free account which is great as they give you an insight into whether your competition was worthwhile. 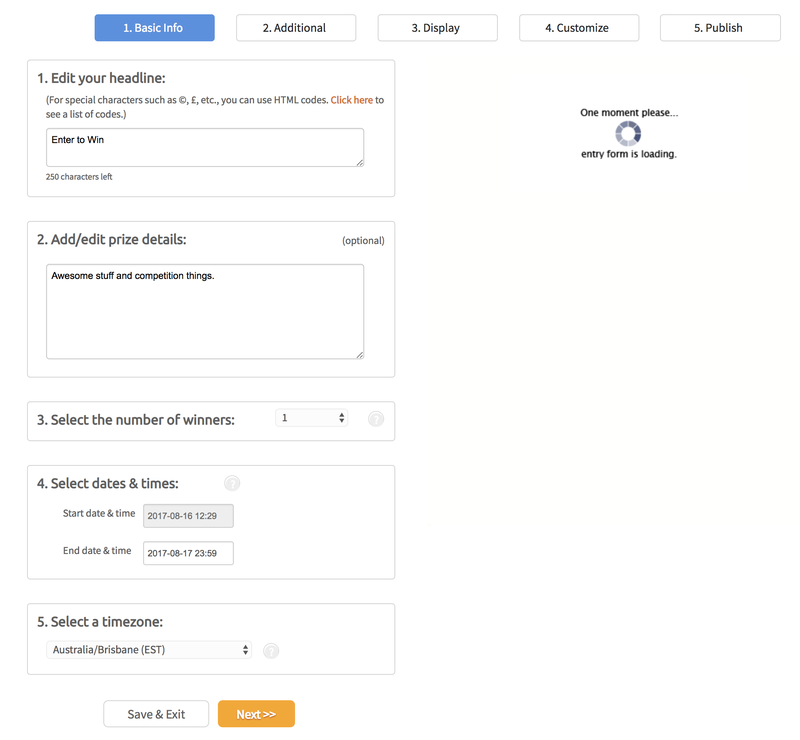 Free tools available are timeline contest (helps you pick a winner from likes and comments on a page), forms for collecting emails and image upload (which is literally just an image upload). There is such a huge range of apps offered that you’re sure to find something that works for you and your brand and they even have direct integration with Canva inside their app, that’s a huge thumbs up from me. Cons: A credit card is required for the free trial of their paid apps. I don’t know why but this just really irks me and is a huge barrier that prevents people signing up for a free trial. It just doesn’t make sense to me. That aside, it’s pretty confusing once you’re in the dashboard as you actually have to add apps to your account, I mean, I understand why they do this because they’re hoping people will add the paid apps so they can ask them to pay/upgrade but it’s still frustrating. Since initially reviewing the app, TabSite now let you build a campaign using the paid apps, then pay before launch which was one of my bugbears last time so I’m pleased to see this. Price: $29.95USD per month for one app, $59.95 per month for 5 apps and $79.95 for all of the apps. There’s also a small agency plan at $149.95USD per month that comes with the condition “Includes all Premium Apps. Can add up to 20 apps. Add additional apps for $5 after 20.” so not sure if that means all apps are included or just 20 apps? Also, there’s an enterprise plan for $299.95 per month for up to 50 apps. Support: They have a help desk which contains searchable guides and how tos with step by step instructions and screenshots which is awesome. It’s searchable but also has a comprehensive list down the right-hand side. If you prefer to submit your own question or can’t find what you’re looking for, you can submit a contact form on their contact us page. Straight out of the box: After some fiddling with adding apps, the timeline contest was a one-page, three-step setup which looked pretty quick and easy but was awkward in practice, requiring me to select a post, choose comment, like or both as the entry method and hit download. I then had to wait for an email to arrive (can take up to 10 minutes), log back in to the platform and download the CSV. Why they can’t just include it in the email I do not know. 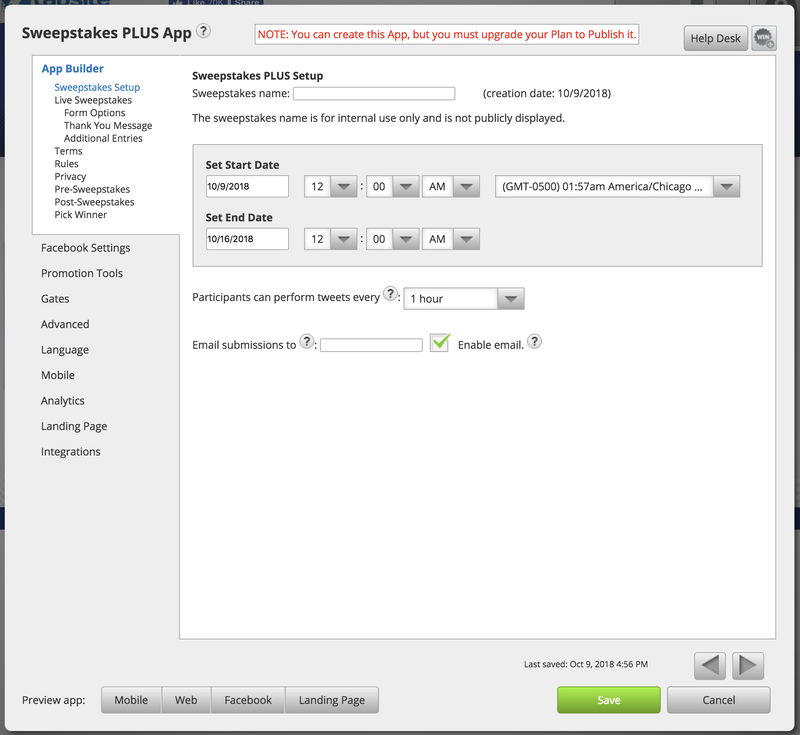 Functionality: A great range of 25 apps to make your competition and promotion life easier. Setup could be a little simpler but on the whole pretty average functionality from what I could see of the free apps. Compatibility: App options for Facebook, Twitter, Pinterest, Instagram and websites. Summary: Vastly improved since last time I reviewed these apps, the example I created looked really professional, but then all of a sudden, the fee was pulled out of thin air and too expensive for what it is. Description: Votigo has refined its offering to contests, sweepstakes, user-generated content and rights management with the campaign builder being the most relevant for the purposes of this review. You can sign up for a 7 day free trial via the pricing page. Pros: 7 day free trial – yay! Heaps of options which all seem to be focussed around competitions and I LOVE that they’ve changed the workflow to show you what your competition would look like pretty much as soon as you enter the title and choose a theme. So much better than before. A comprehensive tutorial makes sure you know exactly what you’re doing on the next page too. Cons: I’m impressed with the improvements they’ve made so I’m splitting hairs with this one, but the tutorial was a bit on the lengthy side and I feel some steps could have been included on the previous screen – namely the opening and closing dates and times. There’s a sudden ‘pay up’ screen again once you click continue which feels like a slap in the face after the lovely editor and beachy background… The form asks for your credit card details straight away rather than launching a pricing table so I have no idea what I’m paying for. Based in: America and India, they do have a phone number as well as a contact form. Price: Starting at $59 (I’m guessing USD) a month or $29 a month when billed annually for small businesses which gives you 3 campaigns (a month I assume) up to 5,000 entries and 25,000 followers. Upgrading to medium for $169 (USD?) a month or $99 a month billed annually, gives you unlimited campaigns and higher entries/followers plus full reporting. For a more personalised service with your own dedicated strategist and more support, you’re up for $349 a month or $249 a month when billed annually. There’s also custom and full service option. These prices are all well and good, not extortionate, not cheap but what did leave me confused is that the campaign I designed redirected me to a page to pay $169 monthly which is most confusing as I didn’t really add anything other than their standard template… What I built was definitely not worth $169, I’ll tell you that for nothing. Support: Support is via your account link when logged in, which redirects you to a resources page where you can submit a form, or you can submit the form via their contact page. 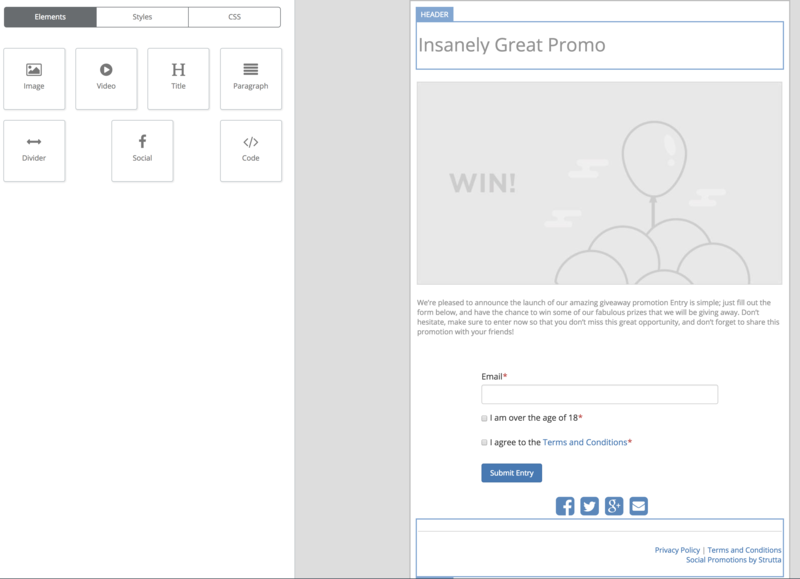 Straight out of the box: Super easy to set up… After logging in and clicking ‘sweeps’ (competitions to you and I), I entered a title, the name of my company and selected a theme and then my example campaign popped up straight in front of me. A vast improvement to before where you didn’t get to see a preview before you were hit with a paywall. Functionality: Looking at their case studies and live examples, they look really customisable and professional and I did like the look of my preview – very polished – I just think a little more finesse when asking for money and explaining why it’s a random amount could be in order! Compatibility: Facebook, Twitter, website, mobile and Instagram. Summary: I really don’t like that a credit card is needed for the free trial and the ‘forever free’ account has disappeared. A wide range of apps though if you have the budget. Description: I have to say, I’ve come across Wishpond several times when researching articles, case studies and the like and they always seem to pop up, so I get the impression they know their stuff. They have a range of marketing and automation products/services on their platform, including the all-important contests and promotions. Under contests and promos, they have 10 apps/different types of contests including sweepstakes, photo contests, Instagram hashtags contest, coupons, essay contests, photo caption competitions, Pinterest contests, referral promotions, video contests and vote contests. I tried out sweepstakes as I have across platforms (where available) to get a like-for-like comparison. Pros: Super easy to navigate the website and separating it out into their different services and sub-services is a great way to make sure we as customers get to exactly what we want and hope to find. Sadly I couldn’t get through the free trial paywall to see if the editor is just as good as it used to be but I do like that ‘unlimited’ contests are included in the starting out package. Cons: Last time I reviewed Wishpond’s competition tools, I was really annoyed that they hid their ‘forever free’ plan (their words not mine) and it appears that forever doesn’t mean forever as they have now removed this option all together from their pricing table. Nice. This is another app that requires a credit card to start a free trial so unfortunately I couldn’t get through to the editor to even create a promotion. Price: Embarrassingly for Wishpond, they seem to have completely removed their ‘forever’ free plan, which is doubly embarrassing for them when I google it to see if I can find a sneaky link to where it is free and just find a whole bunch of press releases telling the world how amazing they are offering marketing automation for free. Oops. They’ve now condensed their pricing into three packages – ‘starting out’ for $75 per month (assuming USD) which is reduced to $49 per month when billed yearly and gives you a maximum 1,000 leads… which is not a lot at all per month, considering you’re paying $49 a month. ‘Everything you need’ is $149 a month ($99 when billed annually) and ups your leads to 2,500 per month and adds A/B testing which is a very handy tool indeed. Finally is their ‘rapid growth’ package which is $299 per month ($199 when billed annually) for up to 10,000 leads and increases from there based of the number of leads. Extra perks in this package include priority support and coaching. They do offer a 14 day free trial… but it’s locked behind a paywall (don’t get me started). Support: There is a knowledge base on the website which is searchable (awesome) and a chat option too as well as training courses. Straight out of the box: Sadly I didn’t even make it to the editor this time as the credit card was required straight up. If your product is great, people will buy it, you don’t need to lock them in with a credit card in order to see the free trial. Let us see what we’re buying before we hand over our bank details. Functionality: Not 100% sure, but if it’s like it used to be (or better) then there’s a range of customisable templates available. Compatibility: Facebook, Twitter, Instagram, Pinterest and website. Summary: Completely wooed me first time around and whilst I’m still very fond of it, it’s lost its shine a little. Still a good little app though. Description: Woobox offers no less 25 apps, including quizzes, polls and instant win but I’ve gone with sweepstakes for this review. Signing up for a free trial actually means free, with no credit card needed (woohoo, big tick from me). I can now play around with all of their apps and features until I’m happy with my design and I’m ready to pay. 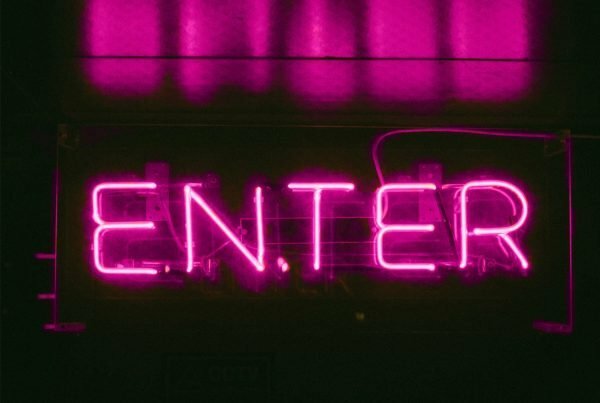 Pros: The drag and drop editor is simple to use and allows you to customise each page your entrant will see – from pre-start, fan gate and entry to post entry and ended screens. The interface is super clean and allows image backgrounds, a huge range of fonts and customisable colours. So what I hear you say? Brand recognition and awareness, I eagerly reply. 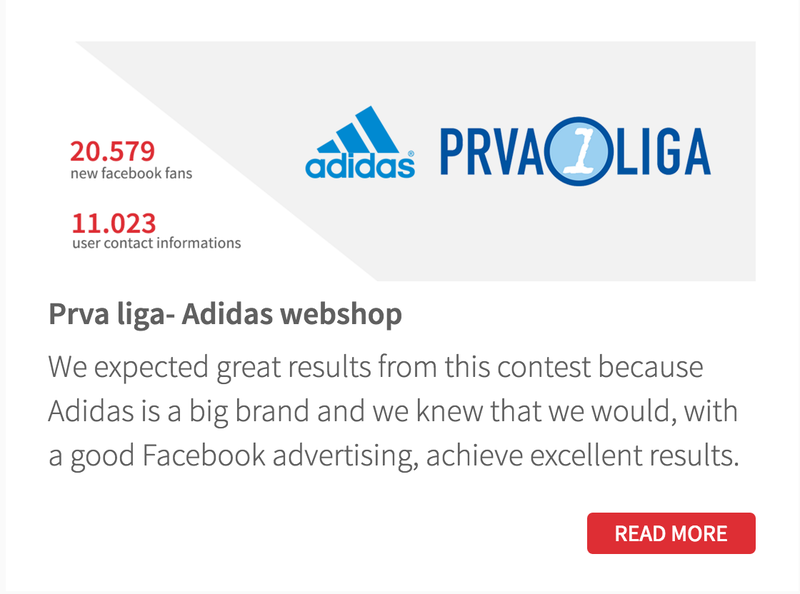 The analytics are awesome – showing you entries, likes, shares, visits and invites which is pretty damned comprehensive. I’m impressed because it can allow you to work out and calculate all kinds of metrics including conversion. OK I’ll stop nerding out now. Cons: The editor is a vast improvement on the old editor but still quite basic compared to some. They could easily add a ‘next’ button when you finish editing the options in one tab as it took me a while to realise it wasn’t loading and I had to manually click through each tab in the left-hand menu to get set up. Small things, that’s me splitting hairs though. Support: There’s no obvious support tab from within the dashboard, but a teeny little ‘?’ link in the top right-hand corner gives me access to the support center and an email address to contact. On the main website there’s also an email and a phone number. Straight out of the box: I described Woobox as ‘stupidly easy’ last time and whilst it’s still easy, it’s a teensy bit more clunky, mainly around the payment and customisation features. Still very easy to set up and I still think it looks fantastic as a standalone app. Functionality: Everything was still very easy and just enough advanced features to make you feel you’re getting value for money. I love the fact that you get all the different pages from enter to thank you included with the app and their free pick a winner tool is awesome. The added compatibility with more than just Facebook is just icing on the cake. Compatibility: Facebook, Pinterest, Instagram, YouTube, Twitter and website. Summary: Offerpop rebranded to Wyng in late 2016 – they have still kept their focus on user-generated content (yay! ), their campaigns look professional and fun with a multitude of options beyond simple email collection. Description: With a focus on user generated content (which I’m a big advocate of in case you hadn’t noticed), their offering is a myriad of engaging, interactive and scroll-stopping campaigns for social media. Their ‘Use Cases’ page shows you everything that’s possible with their platform – for competitions it’s everything from the classic sign up to win, submit a photo or video to win and sweepstakes right up to quizzes, hashtag face-offs and custom filters for entries. Pretty cool stuff. Pros: Since rebranding, Wyng have done a fantastic job on their site at showing how well they do what they do. they have a seriously comprehensive offering and there are some great looking case studies and examples of what they can achieve. They are strongly tech focussed and even ran the first ever hashtag campaign for a Super Bowl ad, so they clearly know their stuff and have the big name customers to prove it. They also offer a free (credit card free) 14 day trial, though if you want to go live with your campaign you do have to pay, which is fair enough. Cons: That said, it was a mission to actually sign up for the free trial, with a long form to complete that redirected me to a page that told me to check my email, then checked my email for a link which took me to another form then I was finally allowed in to build my campaign. Have to say, it was worth the wait, their builder feels as comprehensive as ShortStack, without the overwhelming editor to confuse and distract. Only criticism was it was a little jumpy, so adding an element soon jumped to moving an existing element as it jumped around so much. Price: My cons list last time I reviewed this app was that they had no prices on their site, but they’ve since fixed that, which I’m very glad to see. Their DIY campaigns start at $99 a month for unlimited contacts (entries) and 2,000 visits a month. If you want to grow this to 10,000 visits a month and run 2 consecutive campaigns in a month, you’ll need the $299 per month Standard package and finally, if you’re running 4 campaigns a month and up to 15,000 visits, you’ll need the Growth package at a steep $599 per month. There are also custom packages available on request. Support: Once you’re logged in, there’s a little question mark (you can see on the right of the screenshot above) where you can search for answers, otherwise on their main site, they have a chat bot and an enquiry form. Straight out of the box: Super easy, pick a template or campaign type and it loads up right in front of you, ready to customise. To get rid of a section hit the trash can and to edit the information, click the pencil. Super straight forward. Functionality: Offering a huge amount of campaign options that are both fun to run and engaging to your entrants and potential future customers, Wyng has done itself a massive favour by allowing you to sign up for a free trial and experience the platform. They’ve totally won me over with their drap and drop editor (even with bugs) and how easy it is to customise things. You can keep it simple or click edit to get into advanced settings which gets my seal of approval. I’m a little bit in love with it. Compatibility: It looks like it’s mostly website and email-based but I would assume social media integration is possible. If I’ve forgotten an app, or you would like to see your contest app reviewed here, please send me an email and I’ll include it if it’s relevant. Otherwise, if there’s a feature you think I should have reviewed for each of these apps, shoot me an email and I’ll update it for you.